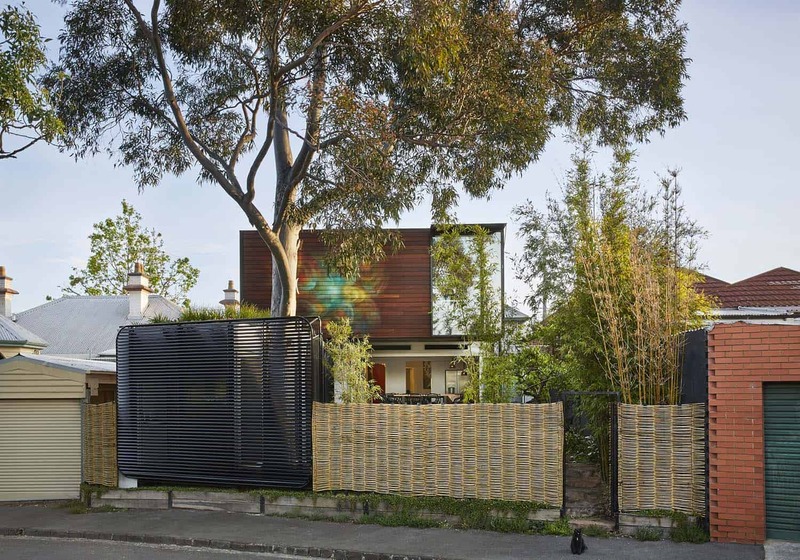 A weatherboard cottage that was originally built in 1927 has been given a contemporary renovation and addition by Austin Maynard Architects, located in North Fitzroy, Melbourne, Australia. 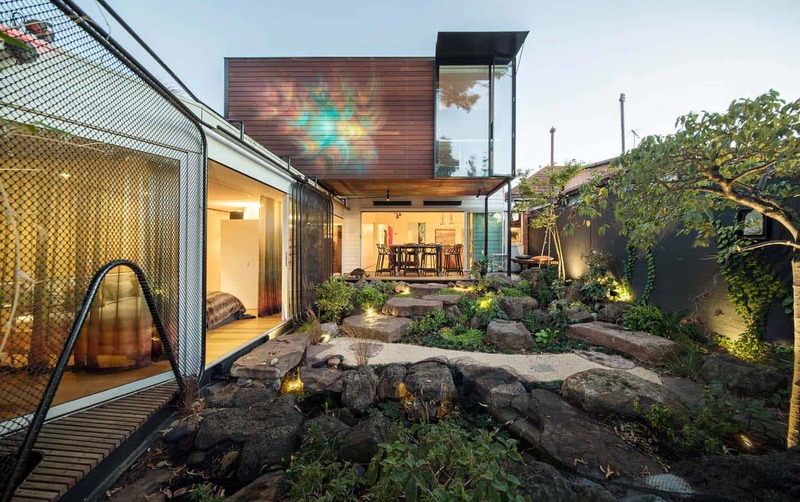 The architects restored and updated the home with a brand new kitchen and bathroom. 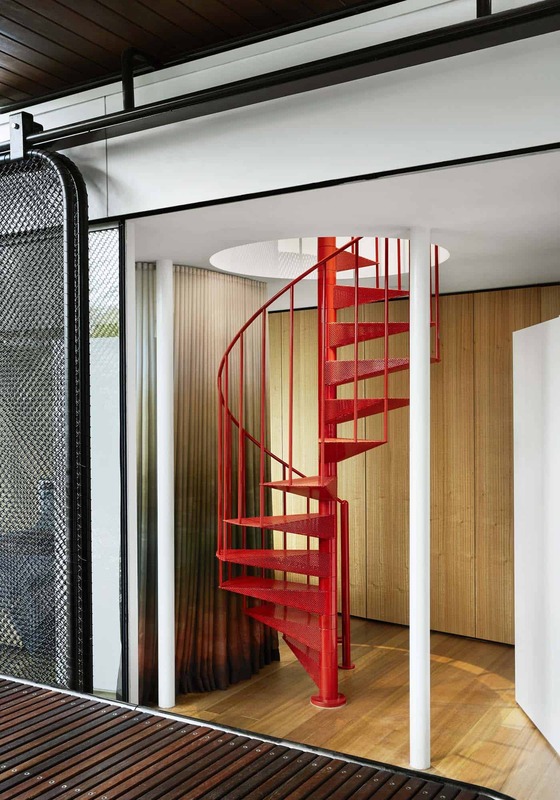 The extension consists of two individual structures, a master bedroom sanctuary—which was built next to the original house—along with a second-story private home office, accessed via a spiral staircase. The homeowners are a couple with three cats, who wished to have their habitat be their own personal “sanctuary”. 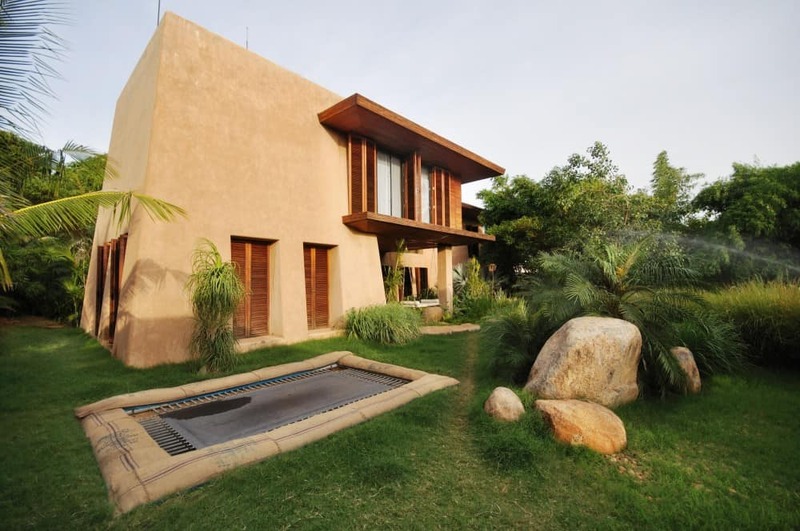 To achieve this, it needed to be light and airy with a strong and positive vibe; a place to entertain family and friends, yet be a haven for relaxation and meditation. 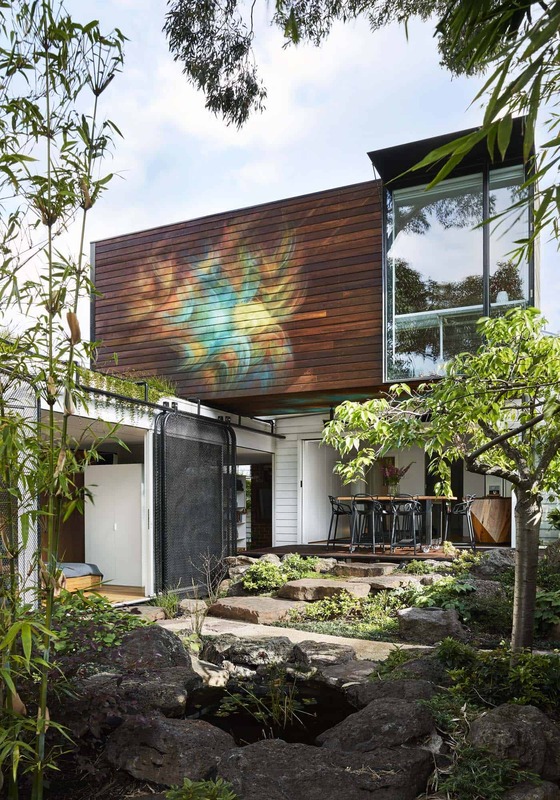 The inspiration for the design of this weatherboard cottage was taken from Japanese gardens and the Buddhist retreats of Kyoto. 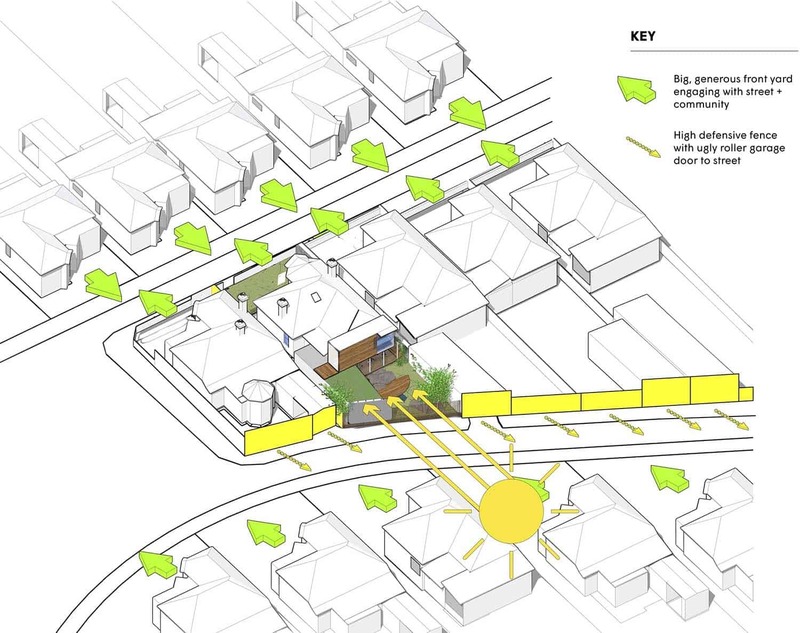 The design reflects the homeowners wishes for a place of peace and mindfulness. 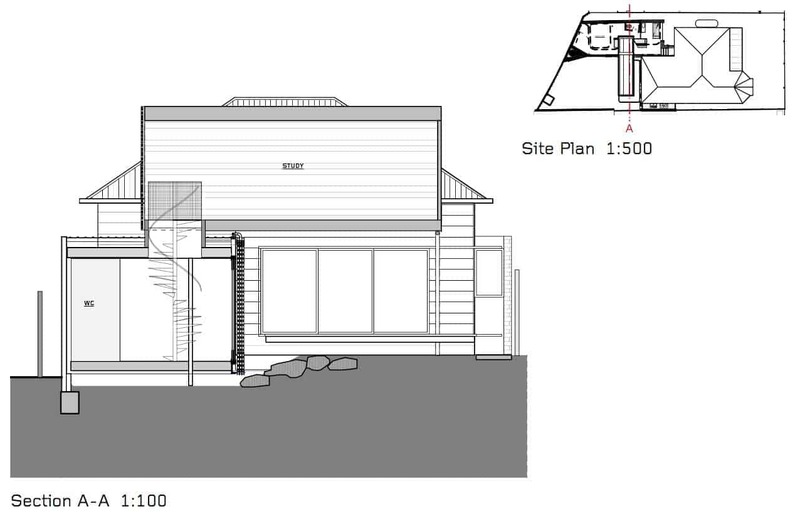 Fact: The original home encompasses 1,022 square feet of living space, while the addition provides 732 square feet. 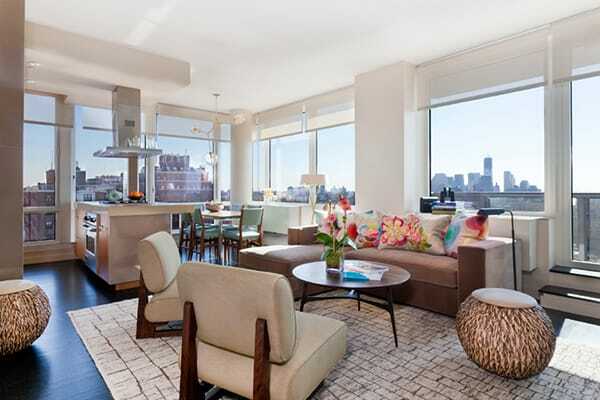 The overall living space of this home is 1,754 square feet, set on a 3,326 square foot property. 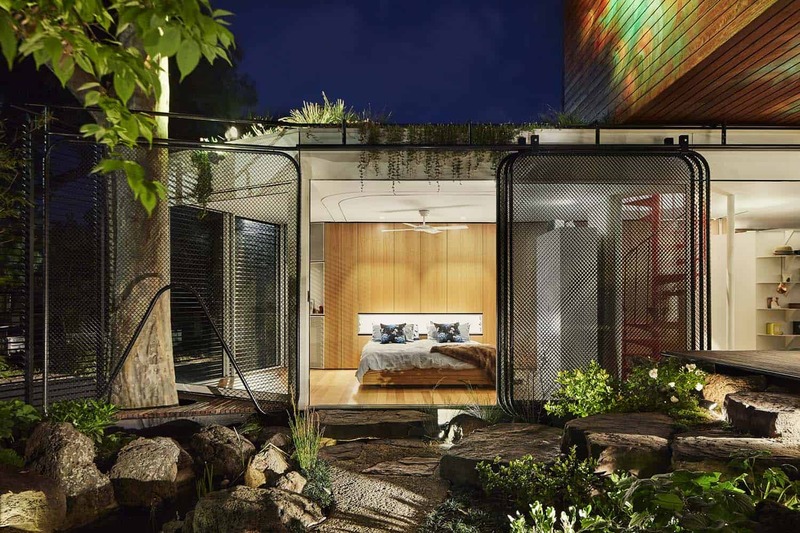 The architects created both private and shared living spaces that seamlessly connects to the garden, yet can be adapted to create solitude and privacy when needed. 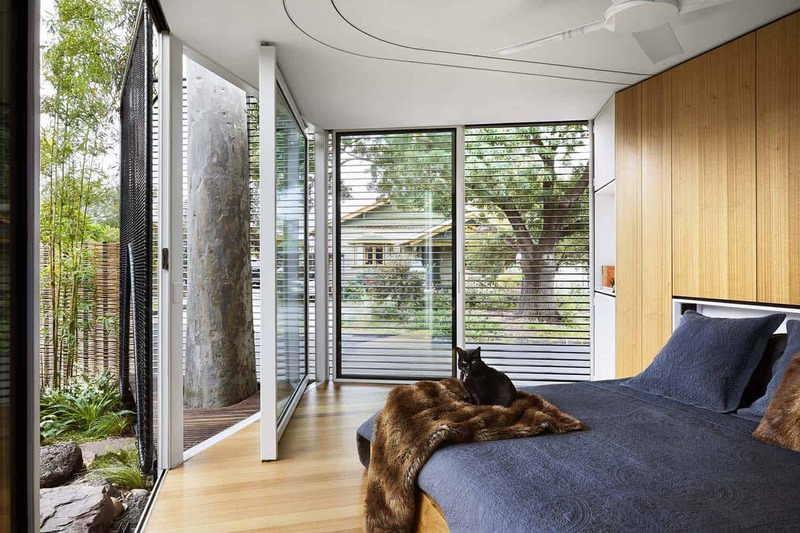 The master bedroom features a dedicated space for Buddhist prayer, which connects to the outdoor garden and ponds through double-glazed, sliding panels. 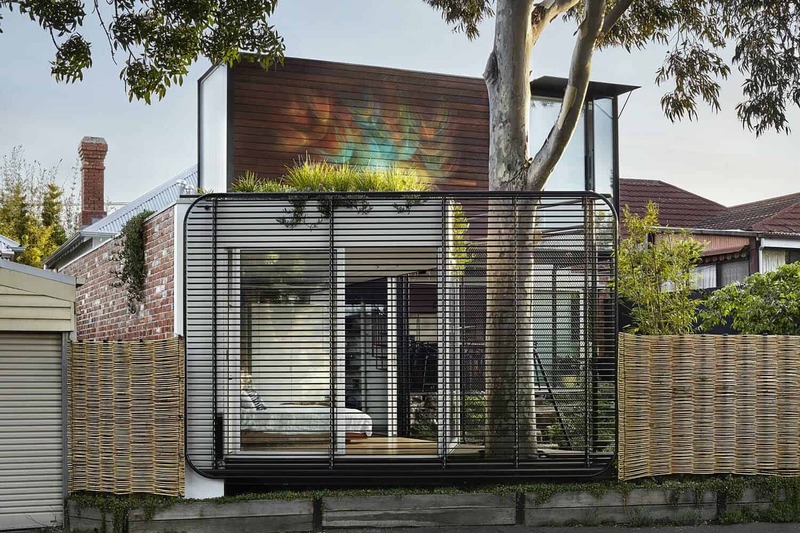 Outside is a mature growth gum tree, encircled by a small deck, offering a relaxing space for meditation. 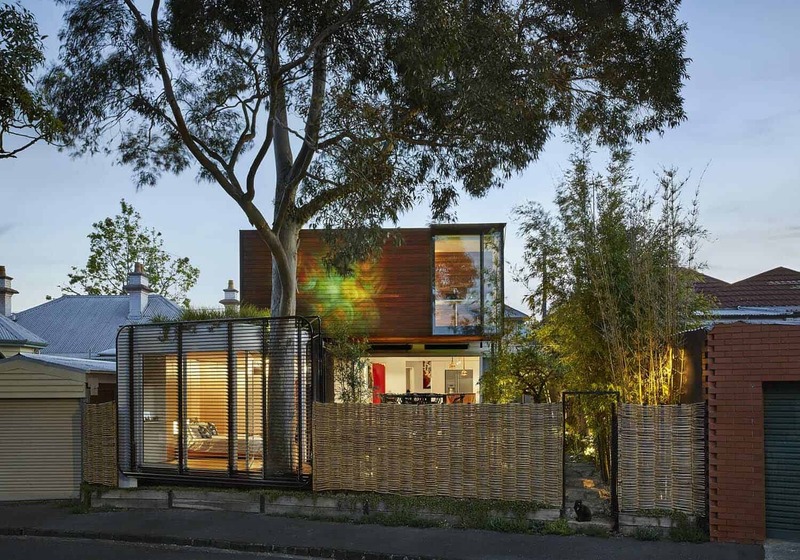 A green roof provides various plants and edible vegetation (Disphyma Crassifolium—a native plant), which offers plenty of insulation, in addition to creating a buffer to protect the home from falling gum tree limbs. 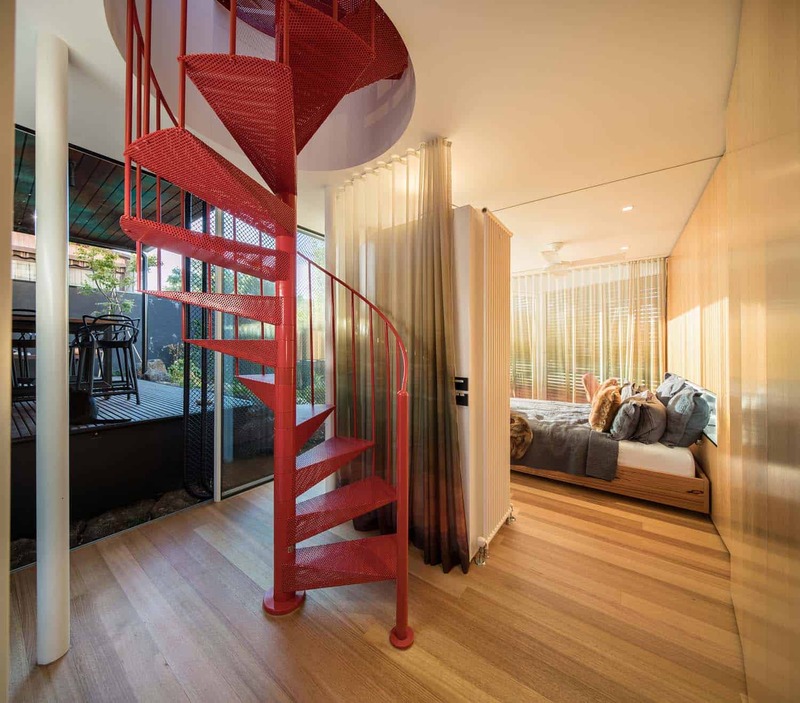 The roof is accessed by a red spiral staircase, which provides a lush rooftop garden for the homeowners to enjoy when they are in their home office. 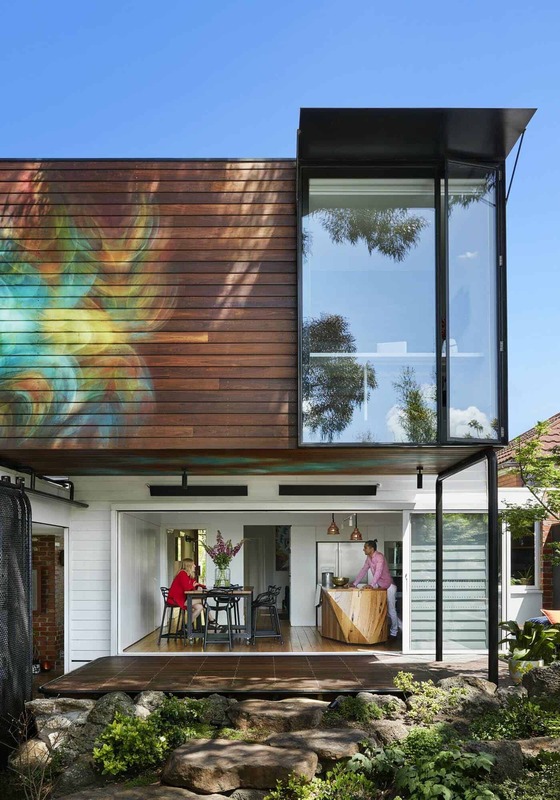 Above: The mural on the side of the timber-clad office is called ‘Awakened Flow’ created by artist Seb Humphreys of Order 55. 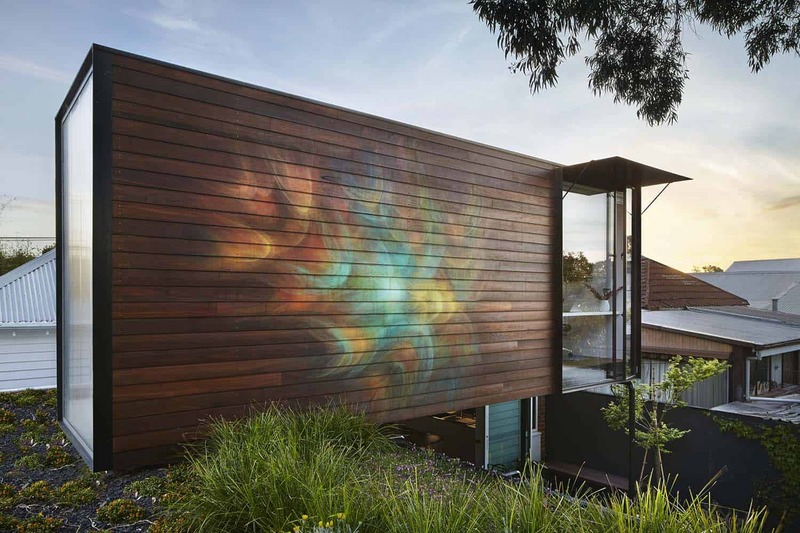 The mural was inspired by the surrounding gardens and overall peaceful nature of this home, offering a subtle explosion of color, contrasting beautifully with the spotted gum tree. 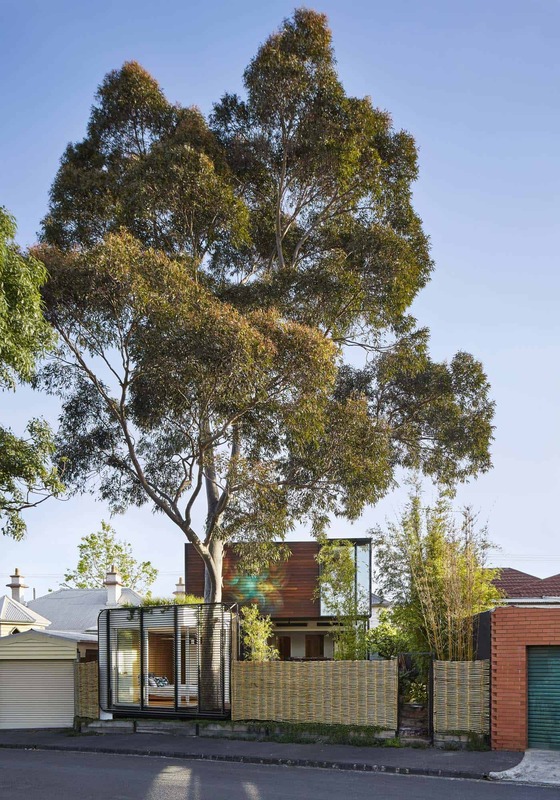 Above: An old towering gum tree dominates the backyard, which has been preserved despite neighbors wishing for it to be removed. 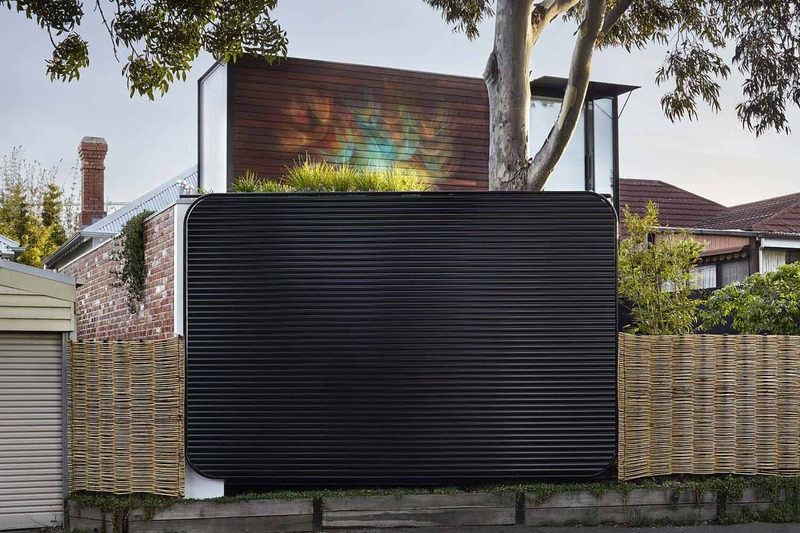 What We Love: This weatherboard cottage provides an incredible sanctuary for both living and working. Relaxing spaces are are offered both indoors and out, with unique design features from the green roof to the mural painted on the exterior of the suspended home office. 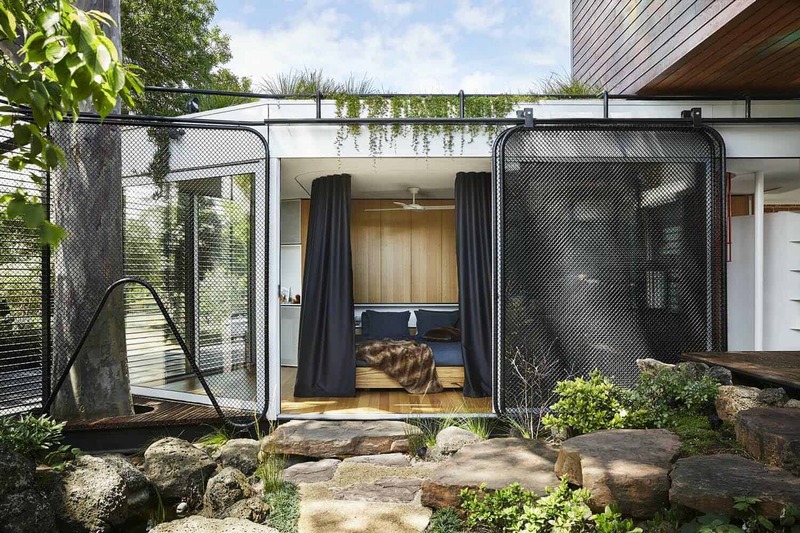 We can imagine this home would be an oasis for working at home, with its private garden and water features… Readers, what do you think, would you work from home if you could live here? Please share your thoughts in the Comments below! 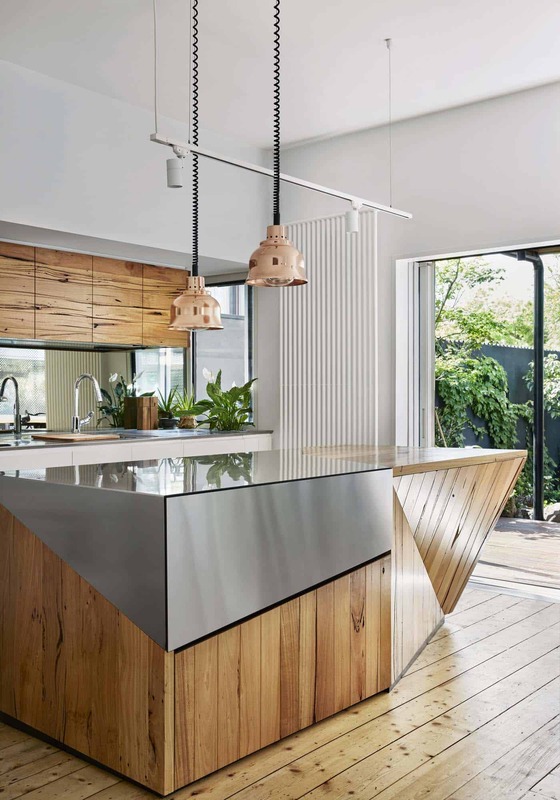 Note: Have a look at another amazing home tour that we have featured here on One Kindesign from the portfolio of Austin Maynard Architects: Indoor/outdoor connectivity defining sustainable Aussie home. 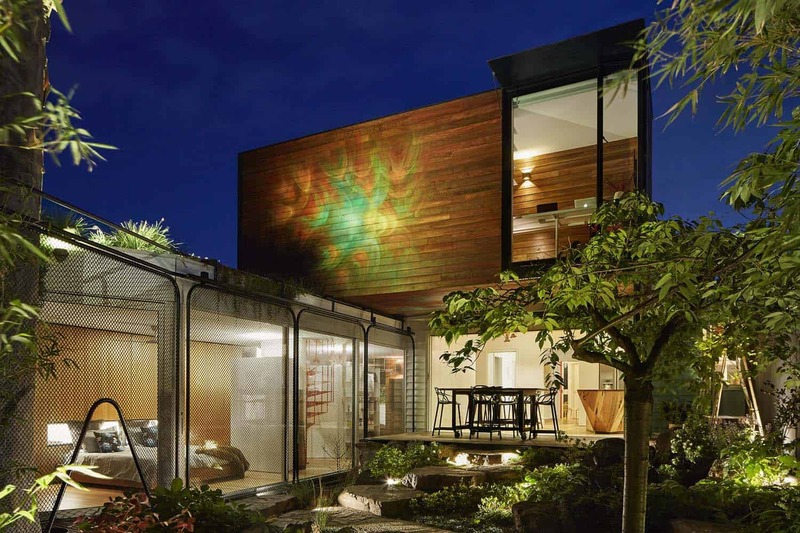 Sustainable Features: Passive solar gain has been achieved in this weatherboard cottage through openings and windows, reducing the need for heating and cooling. All windows are double glazed. 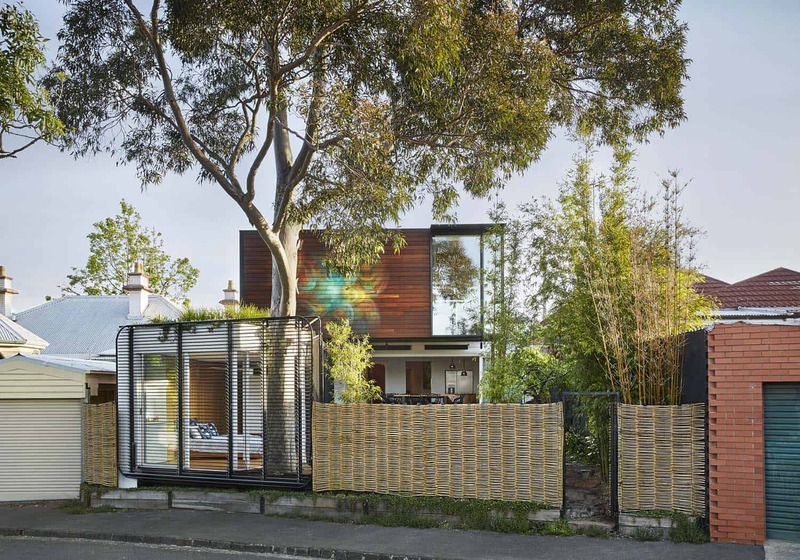 The green roof offers extra insulation, helping to regulate the temperature in the master bedroom retreat. A water tank is used for rainwater harvesting, reused to flush toilets and provide water to the garden. 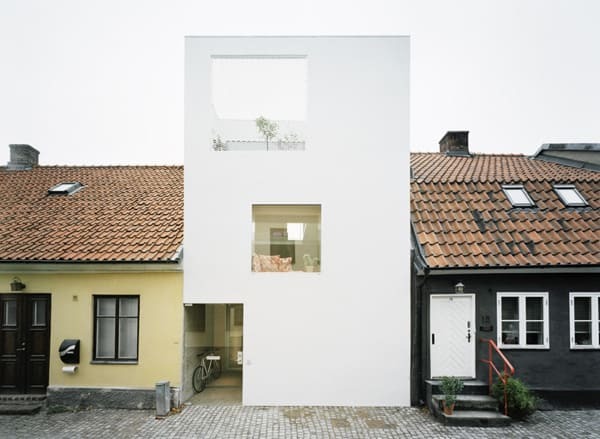 High-performance insulation is used throughout the walls of the home. 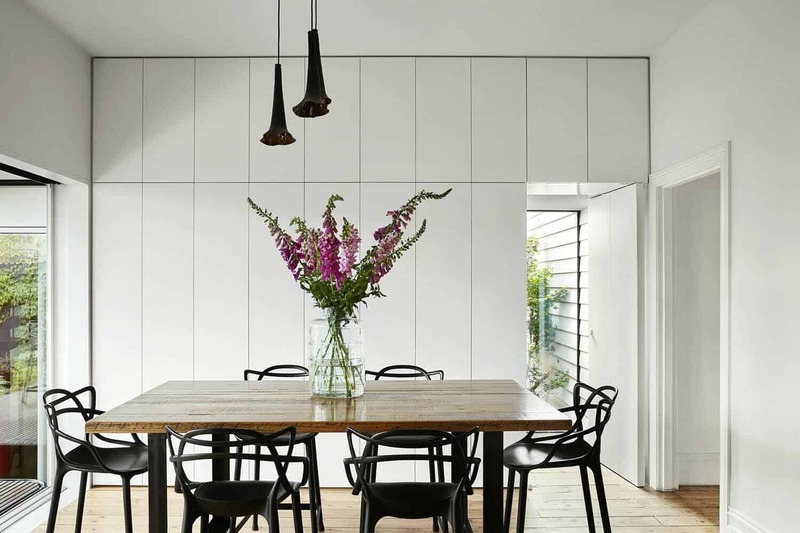 Where possible, local trades have been sourced for materials and fittings. Solar panels with micro-inverters cover the new roof. 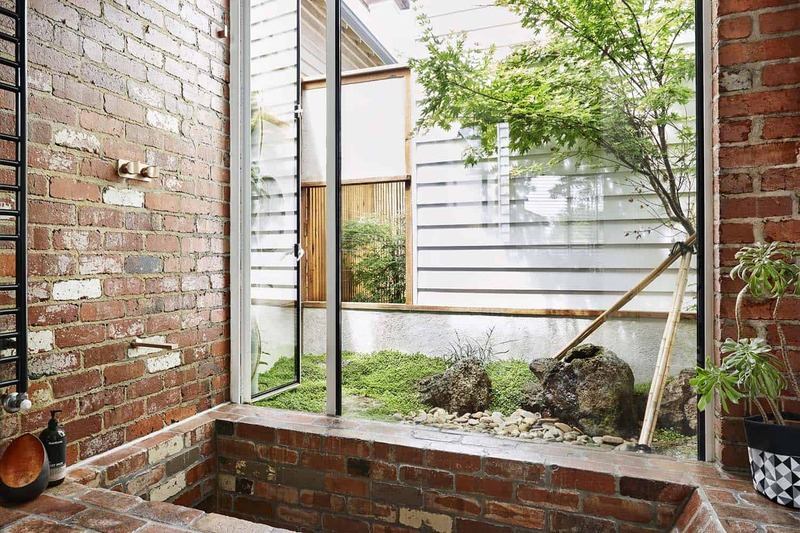 Above: “The Red clay bricks in the bathroom were all salvaged and recycled from demolition sites around Victoria, cleaned by hand without the use of chemicals or machinery,” states the architects. 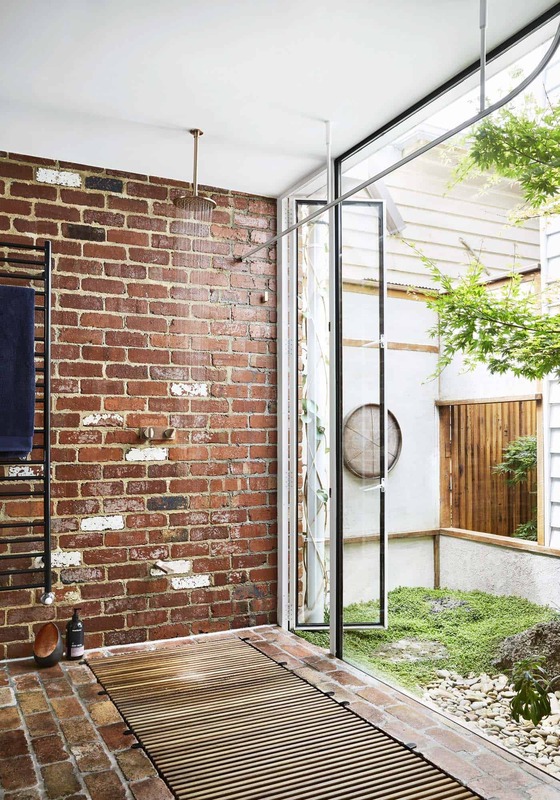 Above: The master bathroom features a sunken brick bath that is large enough to accomodate two. 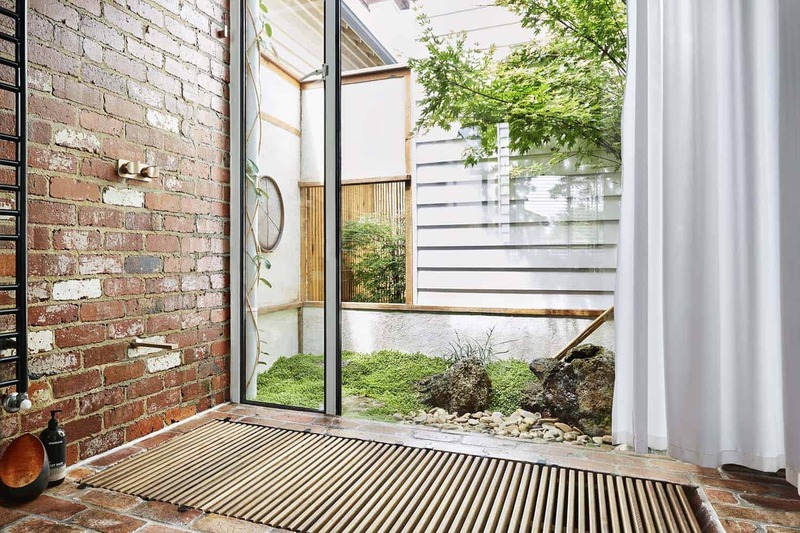 The space opens out to the garden, creating the feel of bathing within the landscape. 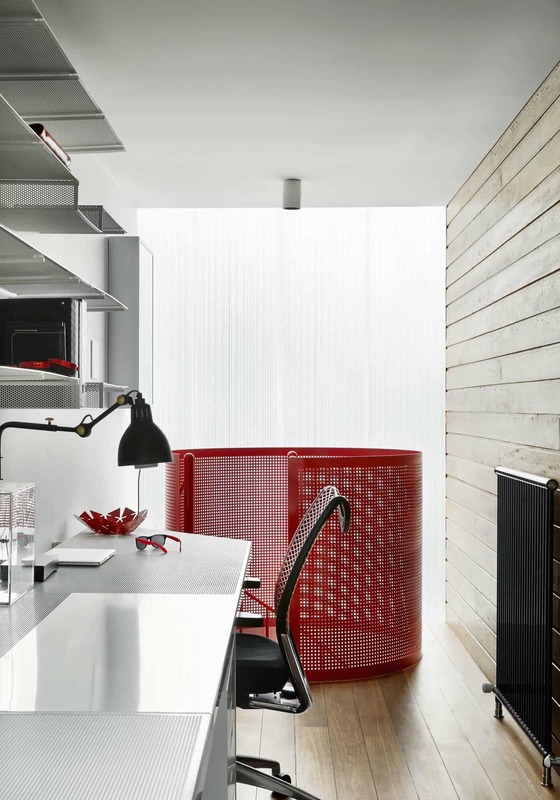 From the bathroom, a secret passage concealed behind cabinetry leads to the kitchen. 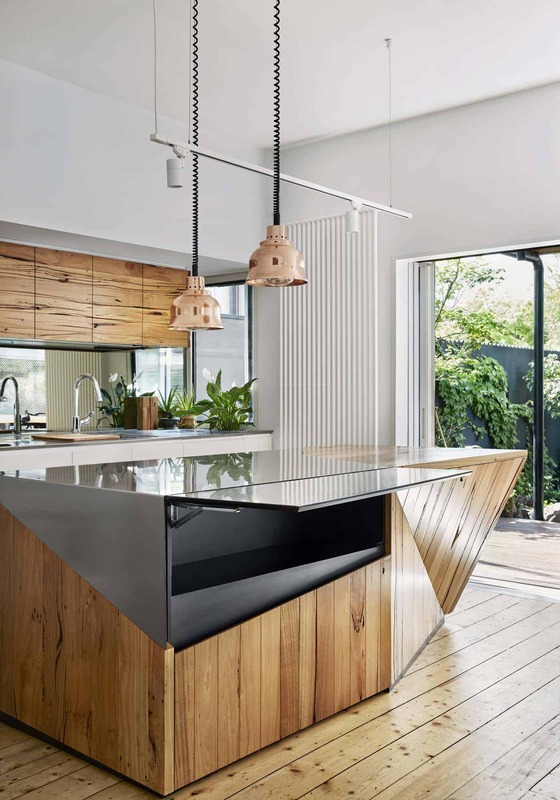 Above: The home incorporates sustainable features, including the timber used in the kitchen. 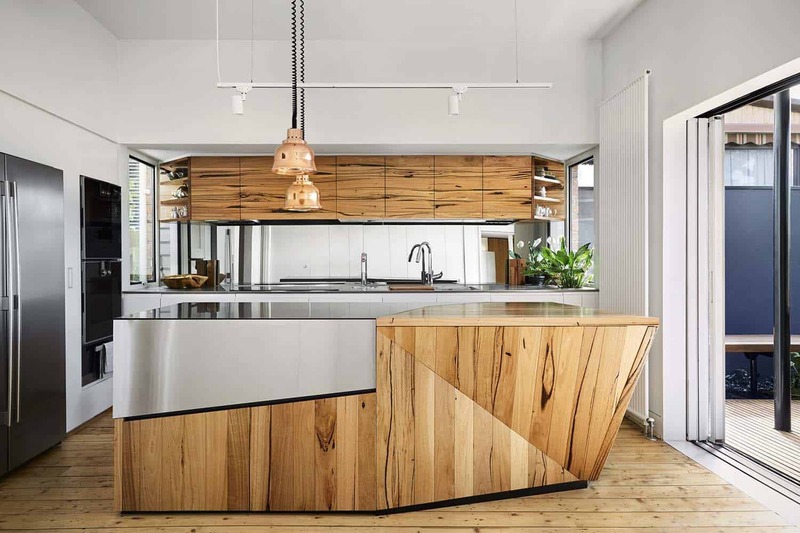 The wood is over 100-years-old, salvaged and recycled from the CSR sugar mills in nearby Yarraville. 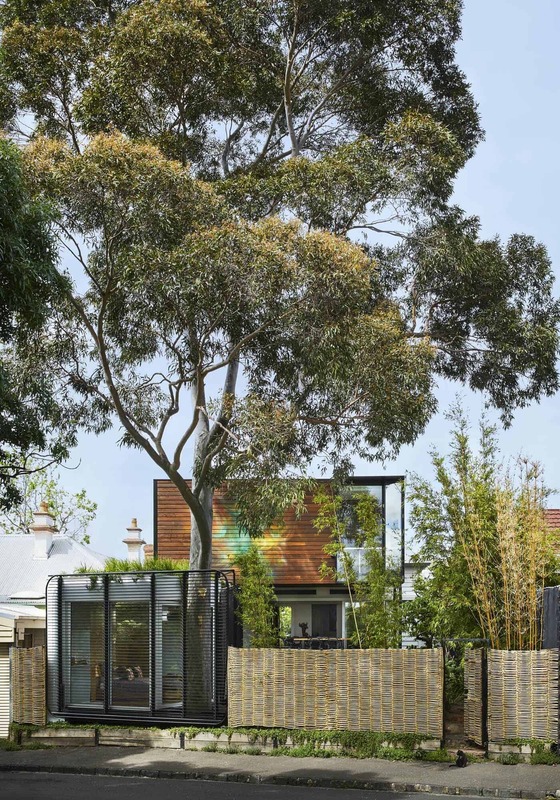 Above: The long and narrow home office is elevated above the deck, in the canopy of the gum tree. 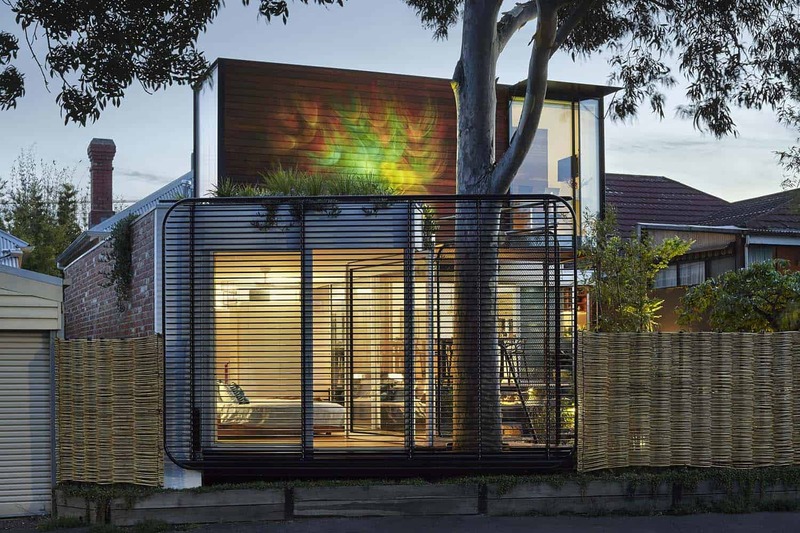 The timber-clad structure features a perforated steel shelving. 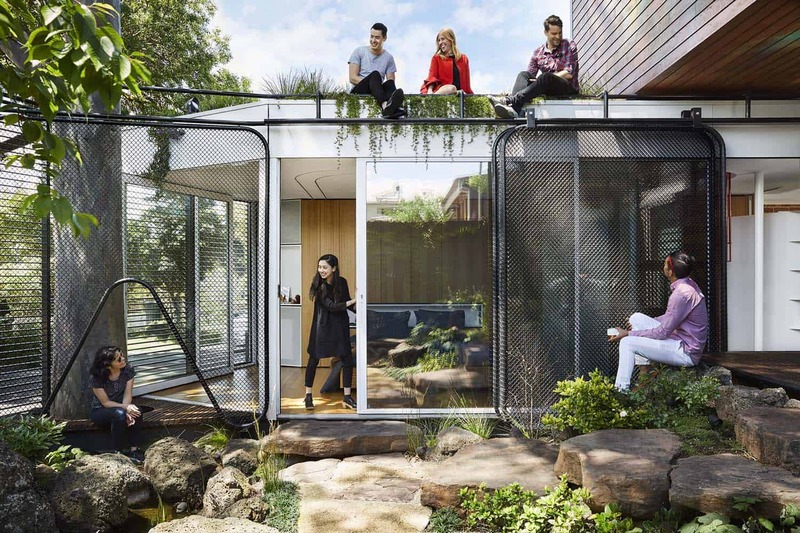 The office overlooks the garden, yet since it is elevated—it feels like its own entity—offering plenty of privacy.